Overview: Welcome back to the Batman team-ups from The Brave and the Bold. Once again, Bob Haney weaves a unique take on Batman, finding unusual ways to bring Batman together with the likes of Green Arrow, Deadman, and the Metal Men. The Brave and the Bold #98 featured Batman meeting up with the Phantom Stranger. While that match-up, in particular, is not huge, it does mark Jim Aparo’s first take on Batman. Aparo was a rising star at DC at this time, having gained notice for his work on Aquaman and The Phantom Stranger. Aparo would then go on to handle the art on nearly 80 of the next 100 issues of The Brave and the Bold. The Brave and the Bold #100 (February-March 1972) featured Batman “teaming up” with Robin, Black Canary, Green Arrow, and Green Lantern. In all actuality, Batman had been shot and needed the other heroes to solve a crime for him while he recovered. This was published around the same time as the “Hard Traveling Heroes” storyline was coming to an end in the pages of Green Lantern (see Showcase Presents Green Lantern Vol. 5 for that full story). Why should these stories be Showcased? : I’ve said it before and I will say it again – any of the team-up books from DC (or Marvel) should be must-own for any fan. This is Batman with some of the greatest art talents of the time (Adams, Aparo, Cardy) providing covers and enticing stories to match the crazy stories being delivered to us by Bob Haney. These stories do not worry about continuity, so try not to take these too seriously. Just enjoy the absurdity of Batman teaming up with Sgt. Rock or the House of Mystery. This entry was posted in Batman, DC Showcase Presents and tagged Batman, Bob Brown, Bob Haney, Jim Aparo, Neal Adams, Nick Cardy, Ross Andru. Bookmark the permalink. 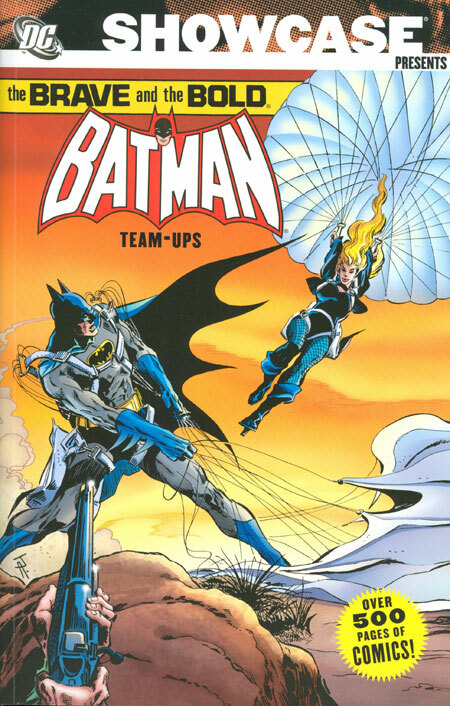 Pingback: Throwback Thursday – Showcase Presents The Brave and The Bold Batman Team-Ups Vol. 2 – WORST. COMIC. PODCAST. EVER!